Panerai has been creating special Chinese New Year watches for a number of years now and, in line with its predecessors, this year’s iteration is part of the Luminor 1950 Sealand range. 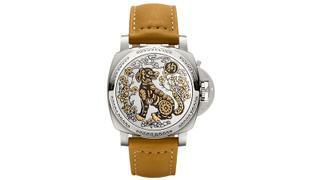 Panerai’s signature 44mm curved square case sports a steel cover engraved using the traditional sparsello technique to depict a gold and black dog inspired by Chinese iconography. Beneath the cover lies a minimalist grey dial while a sapphire crystal caseback reveals a mechanical movement with a three day power reserve and 100 metre water resistance. 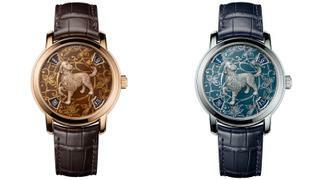 Another watch house known for its annual Chinese Zodiac timepieces, not content with releasing one beautiful Metiers d’Art watch this year, Vacheron Constantin is treating collectors with two editions of its Year of the Dog watch. The first is in platinum with a blue dial and white gold sculpted dog and the second is in rose gold with a bronze dial and pink gold dog. The three-dimensional dogs are created using a technique inspired by an ancient Japanese paper cutting technique known as Jianzhi which Vacheron Constantin reinterpreted to include engraving and enamel work. 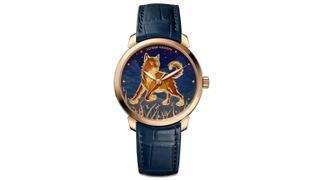 This richly coloured timepiece from Swiss house Ulysse Nardin combines two centuries-old techniques, Grand Feu enamelling and Champlevé engraving, to create a lively depiction of a gold dog emblazoned against a deep blue landscape. Limited to 88 pieces, the Classico Dog boasts a 42-hour power reserve and 50 metre water resistance as well as COSC chronometer certification. The stunning painterly dial on Chopard's Year of the Dog watch was designed for the brand by official Japanese Living National Treasure Kiichiro Masumara. 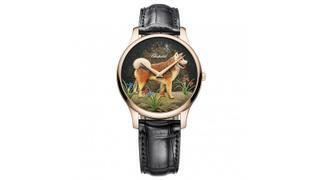 Depicting the Asian Akita breed commonly found in Chinese art, the design is based on the time honoured lacquering techniques of Urushi and Maki-e while beneath lies a thoroughly modern ultra-thin movement with a power reserve of 65 hours and water resistance to 30 metres. 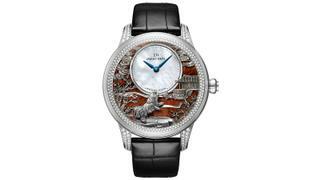 The finer of two Year of the Dog timepieces offered by Jaquet Droz, the Petite Heure Minute Relief Dog is available in white gold with diamonds and a mother-of-pearl subdial or red gold with an onyx subdial. As one would expect of a house famed for its artistic crafts, the dial of this Jaquet Droz timepiece features an incredibly detailed hand-patinated and engraved gold relief applique showing a dog chasing a butterfly in the garden of a traditional Chinese home. 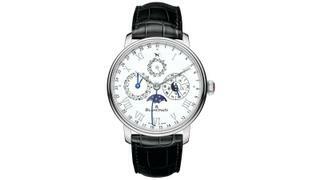 Unlike its rivals, Blancpain has chosen to celebrate the Year of the Dog, not by creating a Metiers d’Art watch, but by introducing a more traditional watch aimed squarely at the Chinese market. The Traditional Chinese Calendar, as the name suggests, features both the Gregorian and Chinese calendars with indications for double-hour numerals, days, months, leap months, moon phases, signs of the zodiac, elements and the ten celestial stems.